I visited one of my favorite local garden centers and picked up these daffodils. They actually have a pleasant fragrance which I usually notice in the mornings. I'll plant them once they're spent! All the snow is finally gone although as some kind of joke we are supposed to get some this evening! Boo!! Good thing it will melt quickly! 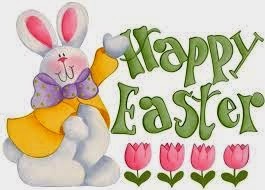 Wishing you blessings at Easter! Beautiful centerpiece and great that you can plant them later. Wishing you a blessed Easter. Lovely daffodils, wish you nice Easterdays! Weather is crazy. We went from 86º to 50º this week. It was so hot that I considered a Easter Sunday Lunch in the picnic form but them they started talking of rain and - uh uh - thunder. Daffodils are so happy and beautiful. Enjoy!